Kes on selle kodanikualgatuse taga? Some students are astonished about the answer: – If you brake down from 30 km/h, your car stops at 13,3 meter and nothing happens. – But if you brake from 50 km/h, you have not even started to brake. The person is overrun at full speed. Today is the International Day of Older Persons. 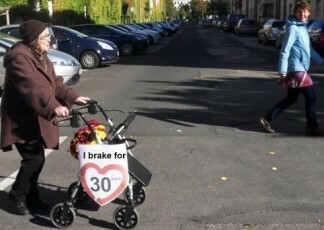 A good day to sign our ECI “30 km/h – making streets liveable!” and also recommend it to your parents and grandparents and all older friends as well. Many local authorities are on their way to better adapted speeds in their cities while the EU commission, who could make things much easier for the municipalities, is still hiding away. – Brussels / Belgium, where the former „Bicycle mayor“ from Copenhagen, Klaus Bondam, signed on 18th September. A panel discussion in Brussels on that day was a really exciting experience. It took place as part of the exhibition “Sustainable2Wheels” in front of the European Parliament, with a representative from the European commission participating. Nearly all people on the panel mentioned our ECI and most of them highlighted its importance and that is was a good initiative to support. The representative from the commission was obviously deeply impressed. So, it seems as if we are approaching our main goal: to set the agenda for the EU commission and make them think about 30 km/h as a European standard – even if we cannot succeed to get all signatures. This is an inspiring side effect and worth all our efforts with our campaign.